(This is my original review from January 28, 2007. What are the chances the first two books I choose to read [and review] are one of the worst (the Brothers) and one of the best (The Once and Future King). It’s great because now I have a good scale to compare the other books I read. This book came recommended by a friend of mine. She thought I would like the explanation the author gives as to how Guinevere could “cheat” on King Arthur with his First In Command and best friend, Lancelot. Although the portion of the book that covers how the two fell in love was actually quite short, it was to the point and very well explained. My friend was right; I loved it. 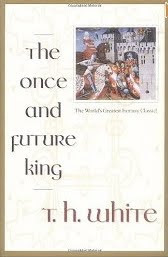 The book is all about the rise and fall of the legendary, King Arthur. The book is actually written in four separate books, The Sword in the Stone, The Queen of Air and Darkness, The Ill-Made Knight, and The Candle in the Wind. The Sword in the Stone is all about Wart, (King Arthur) and his upbringing by foster parent, Sir Ector and Tutor, Merlyn the Magician. It took me a while to get into this book since I felt I already knew how it ended. (Disney created their animation “the Sword and the Stone” based on this book. Disney of course used far less magical animal adventures and altered detail but ultimately it’s the same.) So in short it took me a while to get into it but once I did, I had a hard time putting the book down. This book was fun and whimsical and I loved how the Wart obtained his education by looking deeper into the world the surrounded him and learned to ask question that no one in his time had thought to ask. The Queen of Air and Darkness, delves into Arthur’s pedigree and early kingship and sets up the conflict for the later books. (Those details I will keep out because I don’t want to spoil it.) The general theme to the conflict is one that I truly loved. It deals with how a person can resolve issues that arise due to others manipulation and poor choices. This book is when Arthur learns to think. T.H. White describes the people of that time as acting on impulse and emotion not on thought & rational. Arthur struggles through this book to think about how he can help his countrymen rise out of the age of darkness in which they live. He wants to implement a new and better life for all people and struggles on how he can achieve his end goal. It paints a picture of a young, moral man striving to depend on what he knows of the Lord and of men to create an ideal society. The idea of Camelot thus emerges. Those of you who have spent any time with me since the beginning of November (when I started reading this book) know how much I love this book because I talk about it all the time. The parallels that can be applied from the issues at hand for Arthur to our modern day turmoil were clear and enlightening. Often times if we could just step back and strip our problems of the baggage we attach, we may be able to find a very simple resolution. The Ill-Made Knight is all about Lancelot and his struggle between pleasing God and pleasing men. Lancelot is not the devilishly handsome knight he is made out to be in most Hollywood renditions and is written with humility and kindness. He grasps hold of Arthur’s plan to create Camelot as a young child and makes it his life purpose to help Arthur obtain his goal. Lancelot’s tragic flaw is that his views of life and purpose are fanaticized and idealized and so he is constantly falling short of his dreams. I absolutely loved the end theme of this book and the idea that the atonement works for all men, so long as their desire is pure. Forgiveness can be given to all men. The Candle in the Wind is the last book in this compilation. After Lancelot’s greatest desire was granted to him by God in the previous book he now struggles to maintain his level of spirituality while holding onto his worldly desires. More important than Lancelot’s problems, however, are King Arthur’s. The perfect society he has created has it’s flaws and he must now chose between saving his kingdom by maintaining order and law or save those closest to him by sacrificing the system he spent a lifetime to build. The last chapters of this book were phenomenal. Arthur’s desire to do the right thing constantly pushes him to act and to do and in the end he is beside himself because he cannot “think” a way out of his predicament. It reminded me of my own life and when I struggle with something. I wrestle with it and wrestle with it. I continue to receive a stupor of thought and I search and search for the right thing to do. And then just as I’m about to give up the quiet peace of the spirit enters into my heart and I know that although I may not be able to find a solution, I have done all that I can do and the Lord is pleased with my efforts and the sacrifice I have brought to the alter. *Indicates that the book was rated before February 2008 when I implemented the use of my book-rating calculator.